Looking for something bigger or smaller? Check out the 2 kayak rack, the 4 kayak rack, or the 8 kayak rack! How can you secure your kayak from theft? We have several options for locking/securing kayaks, which could be used in conjunction with this kayak stand. You can find those options here. For the most part, they offer a couple of ways to attach to the kayak and then use a cable system to wrap around a stationary object, such as these kayak dock locks or this universal kayak locking system,; each which will offer a solid level of theft prevention and security for your boats. What does 6 boat rack weigh? I have an adirondack guide boat, 14 ft, a little wider than a normal canoe, weighs 60 lbs. Can rack hold it? Needs to be on top shelf. This Log Rack can support up to 100 pounds per level - so the weight of your Guide Boat would not be a problem, even on the top level. The length of your boat is also not a problem - it will have enough of the boat's length supported. The arms are about 40" long so can hold boats that are fairly wide at the beam and it should be okay if they hang over the edge by a little if wider. 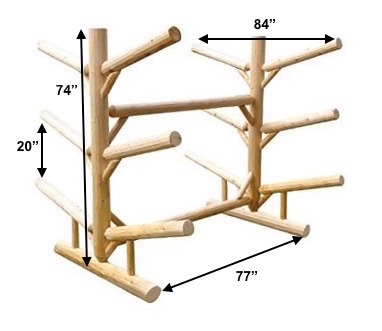 For these log racks, it just helps, and is important, to place them on a level surface, additionally, when you place them on pavers or other solid ground (or the walkway you are making), you also are protecting them somewhat, from not being directly on soil/grass. As to how much support they should have under them, as long as the surface is level, you probably don't need a lot of extra ground. They aren't secured the ground, they are freestanding, and strong; they are 77" long, so a bit under 6 & half feet long, and they are 84" deep, so there they hit 7 feet -- so you probably want to make certain your walkway is going to accommodate those basic measurements, and then add a bit more to ensure there is breathing room. Will this weather to a silver gray like cedar often does? If unfinished, these cedar SUP/Kayak racks will age to a silver-grey in about 2 years of being outside, but will still last for many years. It can be ordered with a stain, or one can stain it themselves if they choose; if so, it is recommended to let it age a bit before staining so the stain will soak in, and it is best to use breathable finishes. The other recommendation for long-term care of these beautiful and strong racks is to not have their feet in direct contact with the ground; it is best to have them on landscaping pavers or such. After order, received product rapidly. Appreciated free shipping. Product with appropriately drilled holes facilitating assembly. Appears durable. My husband and I are very happy with your product. Assembly was very easy only took an hour and our neighbors love the look as do we. Our kayak rack arrived promptly after ordering. With the help of our son-in-law we assembled in about 90 minutes. Directions were very easy to follow. Assembly was very easy. It is a high quality product, well manufactured. We did not need to make any adjustments, all pieces fit properly. And it looks great with our kayaks on it! I received my rack about a week earlier than promised so we got off to a good start! I found it reasonably easy to put together. I'm not an accomplished carpenter and when it comes to mechanically inclined I'm a 6 on a scale of 1-10. It was pretty simple and instructions were OK. I love the look of it compared to others I reviewed and I think the quality of materials and stability were excellent. I added on the end of each vertical post a tie down to metal rods I pounded in the ground to keep any tornado action from throwing it into the next county. But, as is, I think it is heavy enough to handle pretty good winds. I would recommend it to my friends. My neighbor and I put the storage rack together yesterday. It took us about 2 hours. Each part was clearly labeled and the directions were very clear. I have assembled many projects before but this was the first one (honest) where nothing had to be redone. Holes didn't line up, pieces didn't fit together properly, wrong or incomplete hardware etc. This is a quality product and although the price is substantial, I look at it as an investment to safely and securely store my canoes, kayaks, and SUPS. I would strongly recommend this storage rack. My neighbor is a professional cabinet maker and he was equally impressed. We were looking at building something to store our canoe, kayaks and SUPs and I came across storeyourboard. Love the simplicity and ease of assembly. Was able to put it together in about 90 minutes with my 3 kids (teens and twenties). Looks great and is very functional. Our order arrived much quicker than promised. It was put together without any issues. Looks good!